The original 1982 film, Blade Runner, is one of the great cornerstones of science fiction cinema. Among its myriad virtues as a work of art, one that has been crucial in its growing reputation since the 1980s is how prescient it has been. Prescient both in establishing a lot of the aesthetic touchstones of the sci-fi genre and in its ideas about the evolving relationship between human beings and technology. From rapid developments in the “I” portion of AI to ongoing conversations about how filtering life through a digital lens either erodes or enhances human socialization, Blade Runner’s musings about the uneasy nexus between humanity and machinery seem to grow more topical by the day. Ridley Scott’s Blade Runner debuted to relative shrugs a full thirteen years before the Internet would make its grand popular entrance in a flurry of AOL Free Trial CDs and by the time Facebook arrived in 2004 to declare that we would all henceforth live on the Internet, it had basically become something of a grizzled elder statesman. It makes all the sense in the world that our times should have their own Blade Runner film, but it was also a real risk to make one. It’s a dicey move to build upon any well-regarded film, much less a groundbreaking, ceaselessly influential genre classic. There were a lot of variables that could have gone awry. Young French-Canadian director Denis Villeneuve is an immensely talented filmmaker, who proved only last year, with the beautiful and haunting Arrival, that he knows how to craft a science fiction world that has both epic scope and a rich sense of emotion and tone. Still, he is still early in his career and this is no less than one of the sacred texts of modern pop culture. That first film is mentioned in the same hushed tones as the first two brilliant Star Wars films and it brings with it the added challenge of being the thornier, colder, more idiosyncratic cousin to those films. The chance of some turbulence in revisiting this most moody and cerebral of sci-fi worlds was all but guaranteed, and I adjusted my expectations accordingly. It is quite a relief then to say that Blade Runner 2049 is not simply a case of failure averted. This is a major piece of work and the blessed case of a blockbuster with peerless art film credentials. It is beautiful and bracing and cool, and if I cannot yet commit to call it a full-stop brilliant film, then so be it. That does not tarnish its beauty. If anything, all it does is move it even closer into the company of its predecessor; a film to inspire appreciation and awe and just a little bit of puzzlement. Like Blade Runner, Villeneuve’s Blade Runner 2049 cultivates an air of almost aloof headiness, but it wears it very well. Blade Runner 2049 picks up 30 years after the events of the first film, in a Los Angeles that has only grown more shadowy and sinister in that time. Since then, society has continued to create robotic servants called replicants to attend to all manner of human needs. The opening title cards inform us that after the last generation of replicants started rebelling, the government initiated a “blackout” to erase their memories. A wealthy tycoon named Niander Wallace (played broadly but effectively enough by Jared Leto) has stepped in to reinvigorate the flailing robotic industry by creating a newer, more advanced form of replicant that does not have the same rebellious tendencies as previous generations. Despite this newer, more obedient class of replicants coming to the fore, there is still a need to retire the older class and this is where the titular blade runners come in. The job of a blade runner is to hunt rogue replicants and neutralize them, either by convincing them to turn themselves in or by forcefully terminating them. Our protagonist is a blade runner named K (Ryan Gosling, once again proving that he can make steely stoicism feel engaging). K has a knack for retiring replicants, which probably has a lot to do with the fact that he is one himself. In the film’s opening scene, K goes to the house Sapper Morton, (a fine single-scene performance by Dave “Drax the Destroyer” Bautista, in a film filled with fine single-scene performances), a replicant attempting to live the quiet life of a protein farmer. After neutralizing Sapper, K completes his due diligence of searching the premises and finds what look like human bones under an old tree. Forensics tests confirm that they belong to a female replicant and further inspection reveals that this replicant managed to do the impossible: give birth to a child. We come to learn that this replicant is Rachel, who Harrison Ford’s Deckard fell in love with and ran away with at the end of the first film. Blade Runner 2049 is dense with plot, but the main thrust is that K comes to believe that he may be the birth child of Deckard and Rachel. At the same time, his commanding officer (played with understated grace and gravitas by Robin Wright) has ordered him to find and neutralize the replicant offspring. While K is investigating with the aid of his personal AI and paramore, Joi (Ana de Armas, the warm, beating heart of this chilly film), another party is also trying to track down the offspring’s identity. This other party is Luv (Sylvia Hoeks), a female replicant so intelligent, physically lethal and ruthlessly efficient that Wallace uses her as both a key executive in his company and as a kind of all-purpose fixer. She is also the only one of Wallace’s replicants to earn a real name. 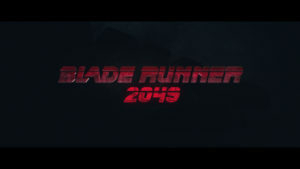 The film is about K’s quest to track down Deckard and learn about his birth, while simultaneously seeming to comply with his mission as a police officer and staying a step ahead of Luv, who wants to find the offspring for Wallace so he can discover the secret to making his own replicants fertile. A great deal more happens involving a great many small, potent characters, but I think I should stop there. Suffice to say that Blade Runner 2049 is an epic in every sense of the word. The most convincing criticism I have heard is that Blade Runner 2049 has an overwhelming, glacial sensibility to it, and I would not entirely disagree with this. 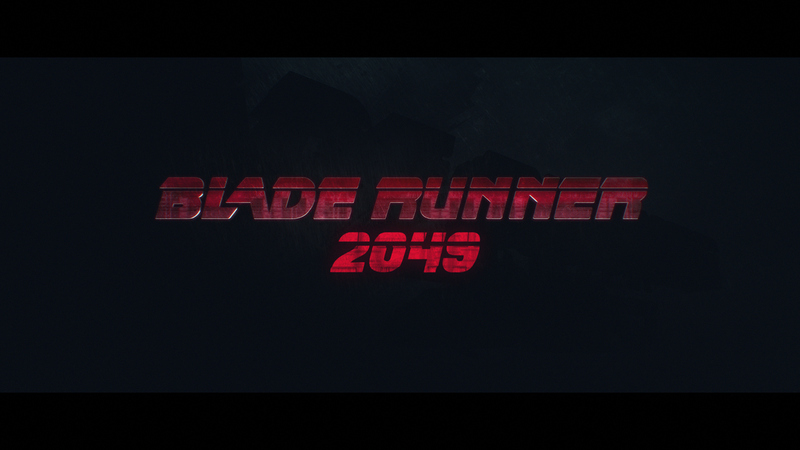 The film is 2 hours and 40 minutes long and it would not be wrong to say that you could make a version of Blade Runner 2049 that is shorter while still being cohesive. Still, a nice, trim version of Blade Runner 2049 would be antithetical to everything that the film is. This is the kind of film that invites you to get lost and absorbed in its world and that world is one of the most stunning, gorgeously conceived science fiction universes I have ever seen. From the hazy neons of futuristic Los Angeles to the vast fields of rusty scrap metal that fill what used to be San Diego to the giant, crumbling statues of women that peer vacantly over the dusty, fallen ruin of Las Vegas. This is an absolute marvel of production design for which no words will suffice and a film with this sense of world-building was never going to look anything less than staggering. To top it all off, the whole spectacle is lensed by the brilliant Roger Deakins, quite possibly the greatest living cinematographer. This is the man who captured the frigid, snowy wastes of Fargo and draped the American South of O Brother Where Art Thou? in emerald greens and honeyed golds. Spending time in this beautiful and ominous world, full of shadows, glowing lights, steam, and smog is key to what makes Blade Runner 2049 a great film and it is crucial that we take a nice, long soak in that milieu. The longer we spend there, the more we can succumb to the power and the mystery of the questions it is asking. Like the first Blade Runner, the central question at the heart of Blade Runner 2049 is really that of what makes a person, or at least what makes a being sentient. And if that old heady standby is the kind of prompt that has been firing up stoned college dorm debates since at least as long as the first Blade Runner debuted, then Blade Runner 2049 is proof that big, starry-eyed discussions about consciousness are still worth having when they are done right. In the case of this film, that means approaching the subject with a healthy dose of rigor to undercut any of the pretension we may be expecting. It also means viewing consciousness as more of an emotional quandary than an intellectual one. To put it another way, Blade Runner 2049 is refreshing because it does not come at the premise of intelligence and personhood with the aim of blowing minds. It knows it is not nearly the first movie to broach this topic. Instead, it succeeds by going for our hearts. The film does not need to definitively answer whether an AI can ever truly be sentient or where intelligence ends and the soul begins, because it is more concerned with the subjective experience of questioning one’s existence. It is curious about the strange, soulful ache that must come with any kind of consciousness and what that feels like. Both Blade Runner films are largely about how terrifying, sad, and bewildering it can be to just realize that one exists. Blade Runner and Blade Runner 2049 can be counted among the most jaw-dropping visual experiences ever put to cinema. They are blockbusters. But I think the fact that the Blade Runner series fits, however uneasily, into popcorn cinema can make people forget that these films are also melancholic tone poems. The first film practically ends with its antagonist resigned to death, delivering an elegiac, heart-rending soliloquy on the erosion of memory and the transience of all life. And this, I would say almost without hesitating, is the most iconic scene. The first Blade Runner contains action and romance and detective noir and it is beloved for all of those elements, but it solidifies its status as a science fiction masterpiece because a sad android sits broken in the rain and laments the fact that he has to die. These films deliver terrific spectacle, but the emotional through-line of this now-franchise is simply that consciousness is a complicated phenomenon; that it is a scary thing to know that one is awake and breathing, and an even scarier thing to know that one will one day cease to do those things. Blade Runner 2049 avoids the pitfalls of the freshman philosophy debate because it does not overstep its bounds by offering answers it lacks. It follows its predecessor’s lead by bathing itself in a reverie of awe-struck wistfulness. It has many questions but most of its answers are white noise. The only sure answer seems to be that we should be kind to anything that exists because existence is a strange and scary thing. To quote my favorite album, Neutral Milk Hotel’s In the Aeroplane Over the Sea, how strange it is to be anything at all. Blade Runner 2049 is not simply asking us tough questions that it cannot answer. I think these films are about how we, as human beings or replicants or whatever lifeform we happen to be, direct those questions out into the ether, to anyone and anything that may be listening. Like the first Blade Runner, Blade Runner 2049 is about the notion of God or gods or whatever we think created us. K is propelled forward by a sudden yearning to know why he exists. Just as many human beings look to various deities for some sign that they are loved by those that created them, both K and his kindred enemy Luv are moved by a need to have some sign that they are loved by their architects. For Luv, this means doing everything in her power to stay in Niander Wallace’s good graces. Beneath her veneer of steely professional competence is a naked hunger for her creator’s approval. For K, who spent much of his life in an orphanage with no hope of ever knowing what created him, the sudden sense that he might have a human father sends him on a mission to find his own creator. Whether we are seeking acceptance from a celestial parent or a biological one, Blade Runner 2049 posits that to be alive is to grasp toward some kind of validation from the powers above us. And as much as K’s quest is about discovering whether replicants can create life for themselves, it is just as much borne out of an unspoken need to find someone who wanted him to exist. This is not a novel philosophy. The idea of a higher power being akin to a parent is a fundamental part of many religions. But Blade Runner 2049 uses it as another emotional building block. It is another layer of fog that the film adds to the experience and another way of showing how thin the line is between humans and replicants. All sentient beings feel self-doubt. They appeal to something greater than themselves for a direction through the mist. It is human to look to our parents and hope that we have made them proud. In the film’s final battle, Luv tells K, “I’m the best one.” It is a moment of arrogance and it comes from the film’s villain, but the line carries an air of sad, almost childish insecurity. The unflagging hunger for her god’s love is what drives Luv to do monstrous things. She may be the most powerful replicant ever built, but she is just as prone to neediness and vulnerability as any other being on the planet. To be alive is to be frail and exposed with our loudest boasts thinly covering our weak points like scraps of tattered cloth. What makes Blade Runner 2049 so much more than an acceptable sequel to Blade Runner is how it does more than ape its predecessor’s philosophical talking points. Like any good sequel, Blade Runner 2049 has an impeccable understanding of the questions that drove the first film and also has ideas about how to expand them. It manages to take Blade Runner’s ideas about the need for love and validation from God or a parent and apply them to the human ache to feel significant to the world around us. While K wants to meet Deckard so he can finally know his father, there is also a deeper longing to learn that he is important. The notion that he could be the figurehead of the greater struggle for replicant personhood shakes him out of his ennui and opens his eyes to a cause that he had formerly ignored. Learning of this destiny will mean he is valued, not only by his parents but by the world at large. Joi tells him that she has always known he is special. This need to be unique, to find that we are indispensable to the world, is what drives K to disregard his orders and rewrite the rules of his mission. It also makes him more similar to Luv than he might ever want to believe. Luv may be desperate to be seen as superior in the eyes of one powerful man, but K is just as desperate to receive a badge of honor from the Universe. Without giving too much away, Blade Runner 2049 throws a wrinkle into K’s vision of himself as a central player in the fate of the world. The film slyly plays into the narrative of the Chosen One, only to subtly invert it in the name of asking insightful questions about what it means to be important. The film sees some folly in the human need to find a hero’s narrative for ourselves, but it is not judgmental of it. As with all its other musings about what it means to be human, Blade Runner 2049 is curious and sympathetic about how people grasp ceaselessly toward some grand purpose. On the one hand, even a delusional belief in our own significance can sometimes embolden us to do things that are courageous and noble and quite beyond what we initially thought ourselves capable of. Still, the film sees folly in the idea of being chosen. Progress, revolution, and social change are complicated forces that require the actions of a great many individuals, and it is probably naïve to think that they could ever hinge on one pivotal figure. The idea that you are that one missing puzzle piece is wrongheaded, but what you are is a single, small thread in the complex, interweaving tapestry of human agency. Every sentient creature has been given the ability to make its own decision and an individual decision can be a thing tremendous power. No one is chosen, but you can choose yourself. You can opt in to what is right and opt out of what is wrong and that power can be a reminder that you are neither powerless nor alone. For all the questions it raises about agency, consciousness, and personhood, Blade Runner 2049 excels best as a movie about the sensory experience of what it means to be alive. In that light, it is fitting to me that the film’s most poignant insights into what it means to exist involve small, tactile pleasures. To be alive is to be able to sense the world around you and come to appreciate it, not as a means to an end but for the strange, beautiful, singular experience it is. 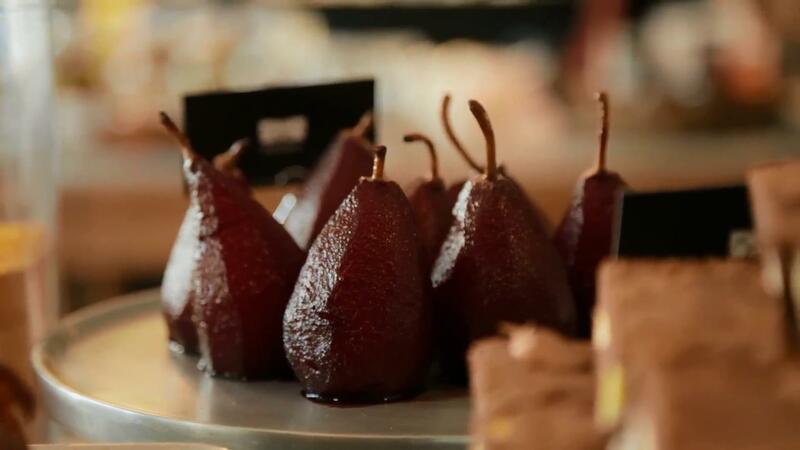 When a jaded K confronts Sapper Morton in the film’s opening, he finds the farmer has been doing more than growing tasteless protein for the world’s cities. He has been harvesting a small stash of garlic for himself. K smells it when he enters the house and Sapper asks if he would like to try some. K does not see the point. He declines Sapper’s offer and then dutifully kills him. K’s major arc is about finding out if he has an all-important destiny but I think it is also about him finding something deeper than duty. I do not know if K would accept a piece of garlic by the film’s end, but I do believe it finds him closer to understanding that life is about luxuriating in small pleasures. When he finally finds Deckard, Deckard utters a line from Robert Louis Stevenson’s Treasure Island. It is about wanting some cheese and Deckard speaks it as if it were the key line in some religious text. He says it as if it were the password to get into some speakeasy and he waits to see if it resonates with K in any way. Does cheese mean anything to you? Does a piece of pop music awaken anything in your soul? Can life be about more than fulfilling our programming or completing some world-altering mission we have created for ourselves? Do you see the joy in the ephemeral, inessential minutiae of life? What does the smell of garlic mean to you? You wouldn’t happen to have a piece of cheese, would you, boy? This is the true essence of the film and it is why I do not need Blade Runner 2049 to be a concise, terse, declarative piece of work. It is about atmosphere and confusion and the senses. To be alive is to be pulled screaming into a waking dream full of color, sounds, smells and tastes. Life is a mystery, but not the kind that you need to solve. 2017 gave me many an opportunity to feel thankful. A new job in the lovely, little city I call home. Countless moments in the company of friends and family. The opportunity to spend time with an amazing nephew just as he’s finding his inimitable two year-old swagger. I saw Chicago for the first time and I made the decision to ask my spouse to marry me. And with all of that said, let me not mince words: I could never bring myself to call 2017 a good year. The past 12 months have been frequently beset with gloom, from the mass shooting in Las Vegas to the deluge that swept through Houston. 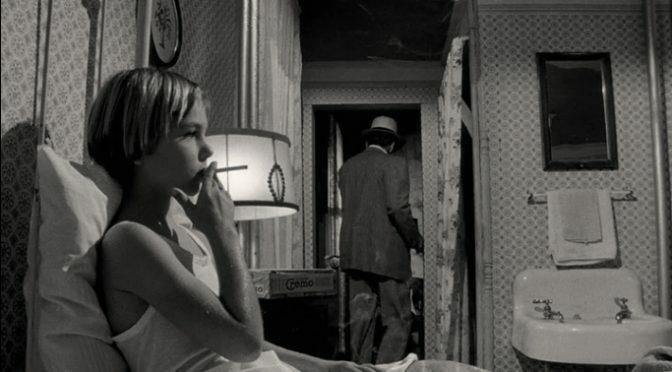 From the conflagrations that razed my home state of California to the profane Hydra of avarice, apathy and bigotry that besieged Washington D.C. And for all the many reasons I love Film, chief among them is its ability to raise its voice in times of conflict. At its best, Film speaks to us of our environment and calls out injustice. And 2017, more than any other year in recent memory, really was a time for Film to smear black makeup under its eyes and help lead the good fight. I am pleased to say there were a number of films that did just that. Some such films appear higher on my year-end list. Others (The Shape of Water, Wonder Woman, Coco) did not make my list, but nonetheless hold my undying admiration for the fine, noble, humane ideas they represent. But as much as this is a time for fortitude and human solidarity, I must confess that the first film on my list is not any great statement about the kind of year 2017 was. It has no real fire to breathe and is not even primarily concerned with humanity at all. 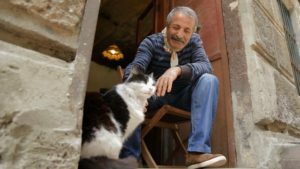 What Kedi, one of the three best documentaries of 2017, does provide is a kind of salve for the burns and abrasions of a tough year. As I type this, even a word as modestly comforting as “salve” feels almost hyperbolic for a movie this disarmingly sweet, but it feels right. Precious few of this year’s films soothed and reassured me the way this one did. At the end of the day, maybe I just came to realize what the greater Internet has known for decades now: as a home remedy for anxiety and dread, there are few cures more effective than watching videos of cats. I do have my tongue a little bit in cheek in calling Kedi a cat video, but it gives me joy to think of it that way. If watching moving images of felines in all their majesty, eccentricity and hilarious inscrutability has long been one of the most reliable sources of joy and relaxation for an entire planet of web surfers, then it only stands to reason that there should be a filet mignon of the genre. 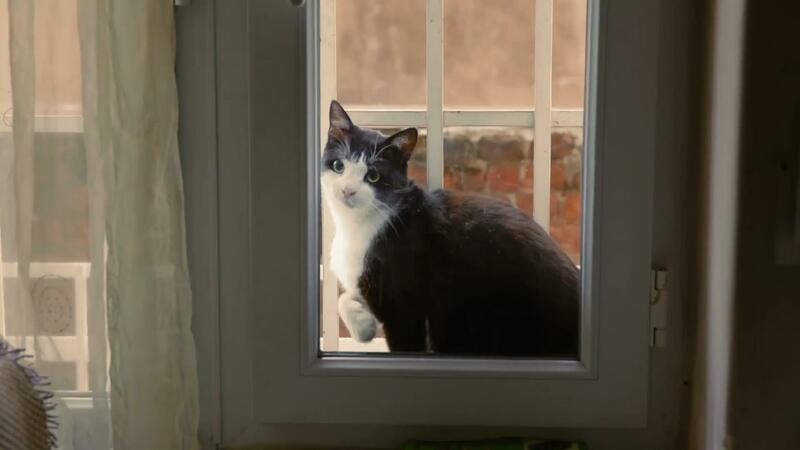 What I love about Kedi is that I can call it the high watermark of cat behavior films, mean it sincerely, and have that be the least of the various compliments it deserves. It is also an ingenious little hybrid of a nature documentary, in which the natural environment happens to be a city. Kedi is not merely a cat movie but a movie about feral cats specifically, and it is even more specifically about the teeming multitude of feral cats that make their home in the Turkish capital of Istanbul. It is a film about the many cats who call this ancient city home and it is about what these peculiar, enigmatic animals mean to that city. One of the most effective conceits of Kedi is how the filmmakers set out to know the cats better by knowing the city better, and vice versa. 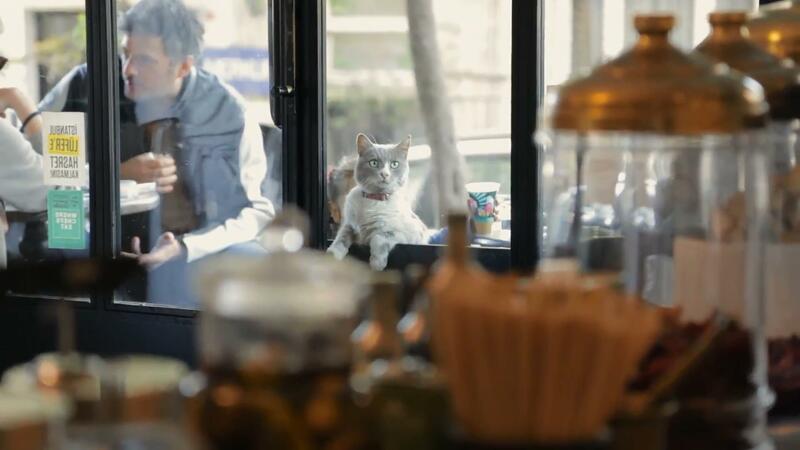 The documentarians follow the cats through this urban landscape and a good part of the wonder comes from how well they assume a cat’s perspective. It is one thing to distantly film lions across a wide open savannah and quite another to literally shadow the wild version of a house cat through the bustling streets and narrow alleyways of a dense cityscape. 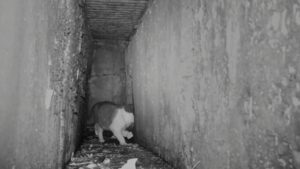 The filmmakers embrace the challenge, not only following their feline subjects into little shops and down side-streets, but using smaller cameras to go with them into the smaller nooks that naturally make up an undomesticated cat’s environment. 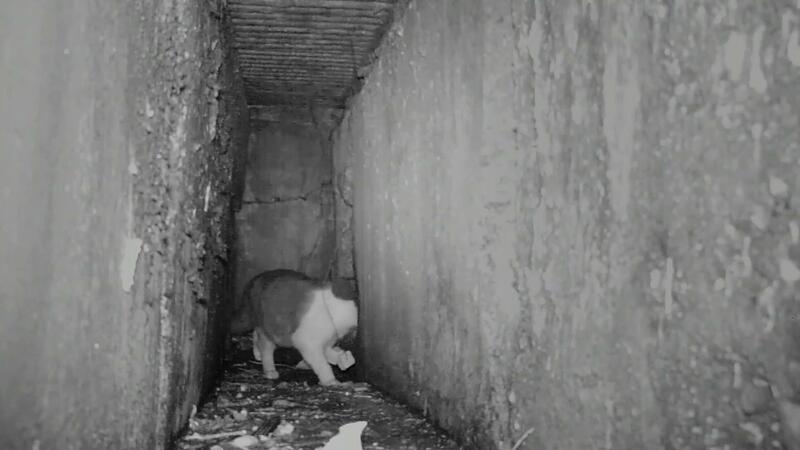 The cameras follow the cats down into the small crevices beneath sidewalks to chase rats and up on to high ledges of old buildings. 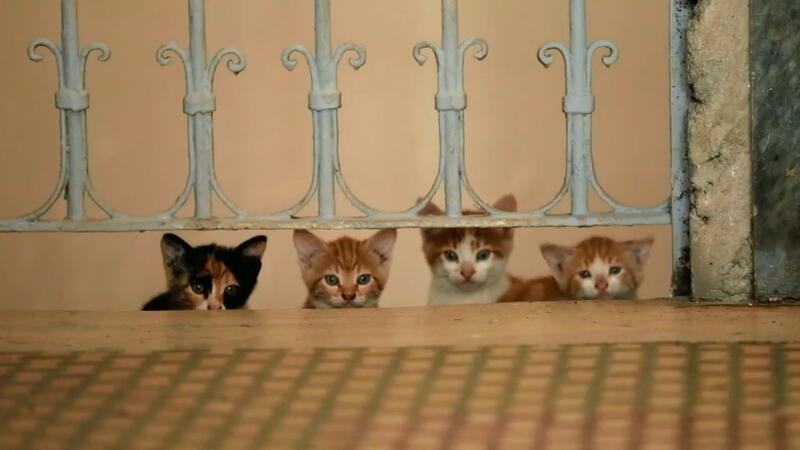 While I have thus far described Kedi as a sweet and modest film, I have to applaud it for being quite a dexterous, energetic piece of filmmaking. In its humble way, it is the kind of documentary I always want more of: curious, observant, and filled with just as much cinematic verve as it needs. The film also gains considerable charm from not simply being about cats in general, but by looking closely at specific cats. 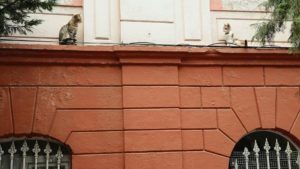 One Istanbul resident marvels that every cat has its own unique personality and Kedi latches onto that idea by giving each cat its own self-contained chapter. One is a mother embracing a newfound sense of courage and responsibility. One is a charismatic ne’er-do-well with a penchant for breaking and entering and getting into fights he is incapable of winning. Another is an enterprising hunter who offers his rodent-killing services to a nice restaurant in exchange for a daily supply of fine fish entrails. One cat is a troublemaker who throws his weight around the local marketplace, and the film salutes his rebellious moxie by giving him his own Turkish rock soundtrack. 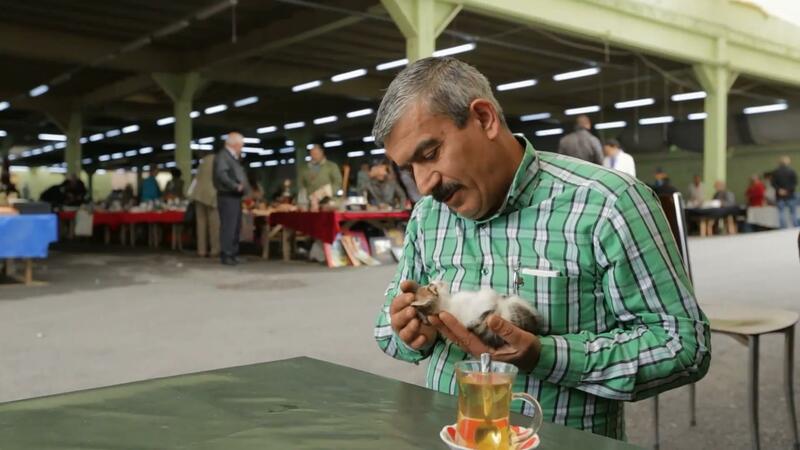 I do not think I am incorrect in calling Kedi a modest film, but there is also such an engaging sense of detail to these animals and their hometown. I could concede that it is a film with humble aspirations, but it is also too attentive, sincere, and genuinely engaged to ever be slight. What makes Kedi so much more than the sum of its feline parts really comes down to a delicate balance of tone. When I first saw the film, I gushed that I had just seen a Linklater film about cats, which is basically the nicest thing that could come out of my mouth, if you know what a lyrical, animal-loving, sentimentalist I am. In the end, what I really mean is that Kedi is warm, gentle, subtly spiritual, and it left me feeling very good about being alive. What really put me in mind of Richard Linklater is probably how lovingly it honors a great city without that ever being its raison d’etre. And here is where Kedi adds another notch to its belt: it stands among the finest travelogues I have ever seen without explicitly setting out to be a travelogue. 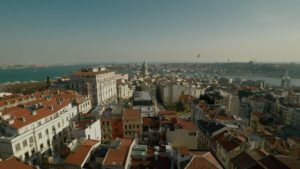 Much as Linklater’s divine Before Sunrise blissfully captured the heart of Vienna by just watching its romantic leads stroll through it, Kedi paints a vivid portrait of modern Istanbul just by following the cats through a beautiful, old city and staying keenly attuned to how they interact with it. 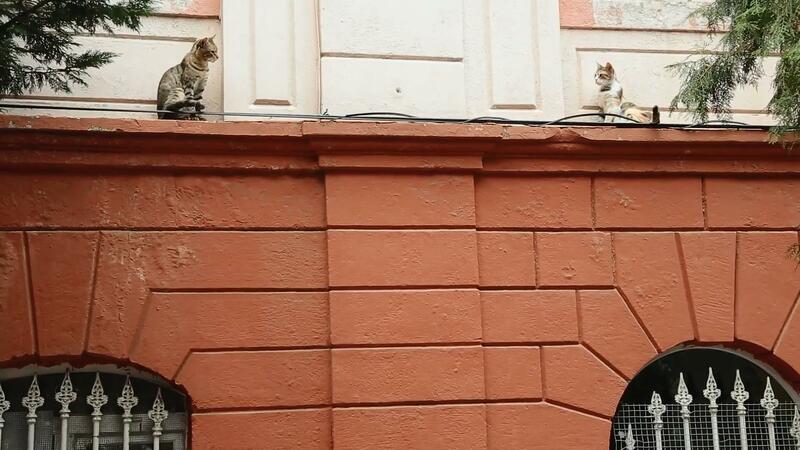 The film’s first title card notes that Istanbul’s cats have been a part of its character and its very architecture for thousands of years, and one of Kedi’s chief arguments is how the lifeforms that occupy a space help to define its personality. Istanbul is not just a city full of cats, in the way that New York City is a city full of rats. 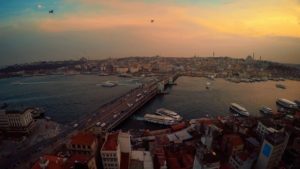 Istanbul is a place that draws an ineffable essence from its most famous animal, and there is great beauty in how it continues to shelter and nurture them. And while I would defend Kedi to the end of my days if it were just the best “cat video” ever made, I can now say that it is much more than that. It is about the soul of Istanbul and how it has become inextricably linked with the spirit of the wild cats that have spent generations upon generations living and thriving there. In that way, it seems to posit that what makes a city beautiful transcends mere architecture. The beauty of a place must be understood through the lifeforms that call it home. 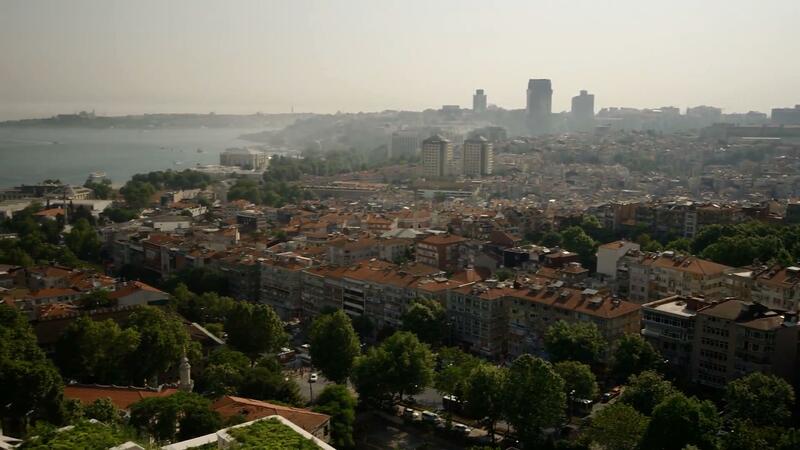 The film’s first image is a panorama of the rooves of Istanbul. I came to appreciate how the film starts from this removed, aerial position and then zooms down into the tiny cracks that truly make up the city. In that way, Kedi says to me that, for as much as one can grasp the beauty of a city from a postcard or the view from an airplane, the true joy of any place exists at the ground level. In the end, Kedi’s twin successes as both a cat documentary and a travelogue of Istanbul do not exist in isolation. They support each other in the same way that the cats and the city have for so long. Following the cats allows us to see Istanbul intimately, and getting to know Istanbul in its finest details allows us to better understand the cats. Kedi is something I had never seen before: a heartfelt tour of a gorgeous city, conducted by that city’s power animal. But what I love the most about Kedi, and what takes it beyond being one of the more novel, well-crafted nature documentaries ever made is how it follows Werner Herzog’s insight in Grizzly Man that films about wild nature are really films about human nature. 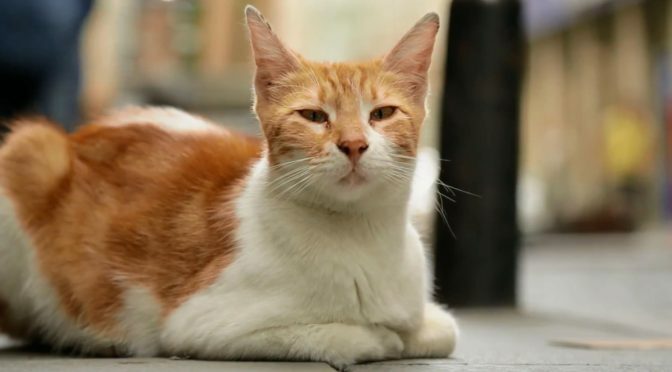 In seeing these street cats as the key to unlocking Istanbul, the filmmakers also imply that these animals can help us understand the generous soul of the city’s people. The filmmakers have palpable love for the way Istanbul’s residents not only tolerate these street cats but treasure them. Kedi shows how a spirit of kindness and curiosity toward another lifeform is really a manifestation of self-curiosity and self-love. On some level, it is about the human tendency to project ourselves on to animals and how that can help put us in touch with our better angels. Animals can be a reflection of our best selves and our aspirations of who we wish we could be. One young woman looks at a cat she feels close to and admires her eloquence and proud femininity. She sees this animal and suddenly she wishes that more women in Turkish society felt as empowered to be defiant with their womanhood. A chef at a fancy delicatessen regards the cat who regularly patronizes his restaurant as an animal of both regal bearing and polite humility. He likes that this animal is determined to find a meal, yet never outwardly begs for his food. He refers to him as a cat with manners; an animal with the refined self-possession of an aristocrat and the moxie of a street kid. As I watched this proud man talk, I wondered how much his impression of this particular cat tapped into a sense of self. I could now imagine a man of meager beginnings who had molded himself into a person of sophistication and substance. And beyond mere projection, Kedi is also about that most precious quality in human beings: empathy. The ability to look at something that is not yourself and care for it. 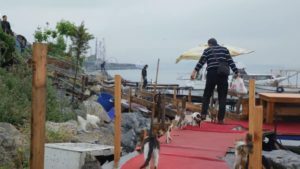 Kedi introduces us to two men who have experienced some hardship and found a renewed feeling of hope and compassion in these street cats. One suffered a financial setback when his boat sank and the other experienced a nervous breakdown. Both have found something restorative in helping the cats, checking in on them and bringing them food and medicine. They seem to have found solace and strength in the simple act of being good to another life in need. “They make you fall in love again”, one man muses contentedly. Kedi is also about the value of basic gratitude for the world around us, be it a cat, a beautiful old city, or a fellow human being. That sense of humble joy really resonated for me on a second viewing. Kedi is filled with a sense of wonder and thankfulness for the simple joys of life and, without making any great fuss about it, I think the film is about how that sense of appreciation can be a bedrock for your soul in times when life feels harsh and austere. One man reflects that if you can find joy in looking at a cat, then the world will be yours. That is a feeling I have long held. That life’s greatest gift is just consciousness itself and our ability to sense and experience the tiniest pleasures of the world around us. And now I want to be very careful not to come off like some sedated self-help guru cliché; to not venture out of my depth and into a quagmire of cheap bromides and pat slogans. There are weighty matters in this wide world of ours, and a great many of them cannot be satisfied by gratitude and appreciative acceptance. I am fairly sure there are quite a lot of injustices that will only start to get better when humanity becomes less grateful and accepting. A sweet, humane film about cats will not fight off any of the threats that loom over our world, nor will it marshal any significant ideological sea change. There are real battles to be fought and serious discourses to be had and, as I said before, I look to Film to get its hands dirty in all of that. But battles do not just need weapons, armor, and ammunition. Wars also require poultices, bandages, and salves. Small trifles still have value in times of strife. We will still have need of gangly comedies, featherweight romances, and glitzy musical extravaganzas. And I am happy to say I am not so far gone that I do not feel a profound sense of adoration for this generous, lyrical cat video. Kedi is a small, good thing and the ability to appreciate small, good things is a way of checking our pulses to make sure we are still human. If Kedi is not a great mirror for our times, it is nevertheless some more humble form of mirror, capable of reflecting ideas that are warm-hearted, wholesome, and no less valuable for being small.